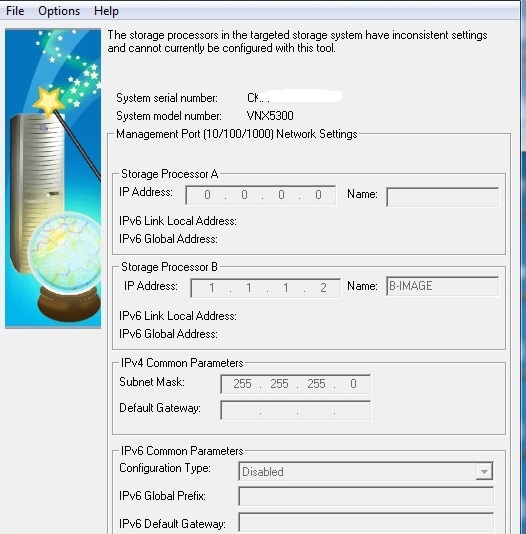 EMC Storage | Hope you like it..
Open it you will see a column “CLUN” and this is the corresponding LUN id for your disk. The storage processor in the targeted storage system have inconsistent settings. When you are initializing a VNX storage via Storage Initialization Tool you may face the below error whereas you will not be able to set an IP addresses for the storage processors. In order to solve this you must connect SPA and SPB management ports to the Ethernet Switch and begin the initialization process. If the above step did not solve your issue ,there was another recommendation from the EMC forums advising that to use a CAT 6 cable and make the NIC setting for duplex as AUTO. keep in mind if there is no cluster aware applications you may damage the data on the shared LUN.